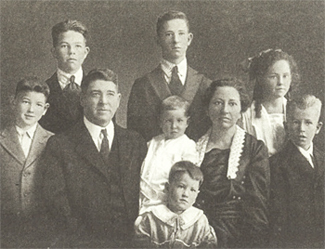 Bobby (center) was the youngest of 7 kids. Bobby's father, Gideon Riggs, Jr was a fundamentalist minister who moved with his wife Agnes from Tennessee to Southern California. He took a single, struggling congregation in a revival tent and grew it into a prominent church with dozens of congregations across the state. Although his father lived most of his 84 years in Los Angeles, Gideon never really left his boyhood home of Tennessee. A farm boy at heart he belonged to a different time and place. Bobby, born and raised in Los Angeles, came to embrace all the city represented—the energy, the newness, the opportunity, the narcissism. The chance to create yourself. Bobby was not tall, handsome, and glamorous. Short, cocky, disheveled, with a gait often compared to a duck's, he never cut the figure of a world-class athlete. As one friend put it, "If you were in a restaurant and someone pointed over to Bobby and said, 'See him? He's the number one tennis player in the world,' you'd say, 'Sure. Have another drink.'"